Home Business Dental implants done right first time! Nowadays when you look for a dentist for your treatment needs you have hundreds of choices and patients can easily be fooled because every doctor claims they are the best and top-notch in their field without the additional education to back them up. The marketing and sales pitch can be quite overwhelming. If you are considering any dental treatment that involve dental implants, esthetic dentures or full mouth reconstruction and want treatment done by a well-trained and highly qualified dentist, then you should consider Dr. Devi, DDS.MS.FICOI. 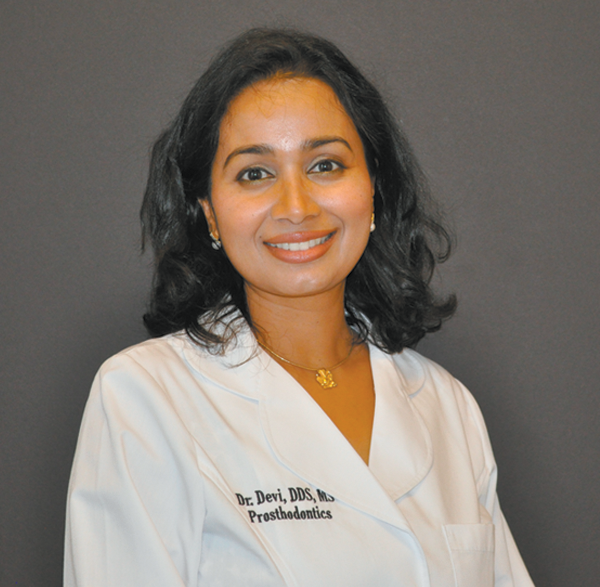 Dr. Devi is a prosthodontist and her exclusive private practice locations are in North Scottsdale/Carefree and the Glendale area. Patients refer her as a genuine and compassionate dentist whom they can trust. Dr. Devi has earned her dental education from top US universities including Loma Linda and specialty training from University of Alabama, Veterans Hospital and New York University and California Implant Institute. Dr. Devi’s research work on dental implants is published in the prestigious Journal of Prosthodontics. Dr. Devi has completed thousands of hours of continuing education to further her knowledge in dentistry. How does the practice stand out? Dentist with 19 years clinical experience and specialty training on Prosthodontics and Implant Surgery. No matter how bad your mouth condition is, prosthodontists with their additional three years of university training can handle the complex treatment needs of patients. Being proficient in advanced restorative treatment procedures and in implant surgical techniques treatment is handled exclusively by Dr. Devi from start to finish – not switching patients from offices to offices. Private meetings with Dr. Devi to discuss, understand and accept treatment plans that suit you. No salespersons in our office pressuring you to make your treatment decisions. Dr. Devi’s primary focus is to improve your mouth condition and quality of life and not to sell cases. Holistic approach in treatments. Dr. Devi helped many patients by treating as a whole person and change habits like smoking. Please, read patient testimonials. Dr. Devi treats only few patients a day and her schedule is kept very light. You will receive the personal attention you deserve. Dr. Devi offers sedation dentistry and treats patients with dental phobia. Her calm personality and gentle touch made it possible for patients with extreme fear to undertake dental treatments after avoiding treatment for many years. Google reviews reveal so many patients’ life-changing stories. Our fees are very reasonable. Dr. Devi can work with you and will offer treatment plans that fit budget constraints. We offer financing plans. Exclusively beautiful, calm private office with an indoor waterfall located at 34597 N 60th St, #101. Dr. Devi offers free consults and your initial visit consists of meeting with Dr. Devi to understand your concerns and treatment goal. Call 480-488-9655.